Well, Saturday Morning, My Birthday today and loved reading about some wanker trying to burgle a an fella’s house and ends up getting a right good belting from an EX Boxer, made my day. 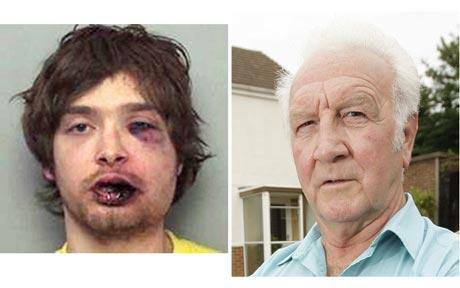 A burglar in England who broke into a house and threatened a 72 year old man with a knife got more than he bargained for when the victim turned out to be a retired boxer who left him bruised and bleeding. Frank Corti, 72, who served with the Royal Engineers in North Africa from 1956-58, dodged the knife and punched Gregory McCalium, 23, twice in the face, giving him a black eye and a swollen lip. He then restrained the attacker until police arrived. McCalium, a barman, was given a four-and-a-half year prison sentence at Oxford Crown Court on Monday for aggravated burglary and was told by the judge he had “got what he deserved”. The court heard Mr Corti was at home in Botley, Oxford, with his wife Margaret, 72, when McCalium, a neighbour, forced his way in at 8am on Aug 19 last year. McCalium was drunk. McCalium had denied the charge and claimed he could not remember what happened. This entry was posted in Just For Laughs and tagged boxing, burglar, criminal, hero, news.